It is inspiring to see the long lines of people doing their civic duty this week at the polls. Traditionally mid term elections aren't as well represented. Why are record breaking numbers showing up at the polls? It is obvious that, this year, people are passionate about issues and making sure their voices are heard. Perhaps we should consider all year long, what are we Jewishly passionate about? Are we making our voices heard? Does Hashem hear the sounds of Torah study, prayer and calls for Moshiach rising from our homes and Shabbos tables? This year, let's be passionate about - and vote for - Moshiach, now! 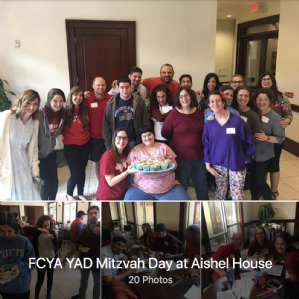 ☞ Check out and vote for your favorite pic in the photo albumfrom last Sunday when Young professionals and young adults with FCYA (Friendship Circle of Houston - Young Adults) with disABILITIES came to work together at Aishel House to create "Food for Friends". YAD Houston Volunteers prepared soup, breads and dessert in the Aishel House kitchens for patients and their families staying at Aishel House or nearby hospitals at the Texas Medical Center. Oct 28: Last chance to register to vote for your favorite soup this Sunday! www.chabaduptown.org/supersoup learn nutrition, enjoy mushroom barley, pea and chicken soups and have a great time! Thank you to all the Super Sponsors! Nov. 9-11: Vote for teens! CTeen Texas Regional Shabbaton in S. Antonio! Nov. 11: Vote for our team at the Friendship Walk! Walking fun for the whole family for a great cause on a Sunday! Dec. 3 & 9: Save the dates with your vote of confidence in our Chabad of Uptown signature Chanukah events! Why Is Inviting Guests Such a Mitzvah? Follow us on Facebook, Twitter & YouTube @youngchabad!